Honda’s new Civic Si is here, and well, we’re a bit underwhelmed. We’ve known for some time that the Si would be turbocharged with the 1.5-liter already used in the Civic line, but with lead ups from Honda claiming this to be the “fastest, most powerful Si yet,” seeing the same horsepower rating from the previous Si is like ordering a chocolate ice cream cone and getting vanilla. Yeah, you’ll eat the vanilla and it will be okay, but it’s totally not what you wanted. In this instance, “most powerful” is referring to engine’s 192 pound-feet of peak torque, which is more than any other Civic Si has offered (up from 174 lb-ft in the last Si). Compared with the previous model’s naturally-aspirated 2.4-liter engine, Honda says the boosted 1.5-liter reaches peak horsepower 1,300 rpm sooner, with max torque reached a full 2,300 rpm lower. More importantly, that torque is available from 2,100 rpm to 5,000 rpm – covering 70 percent of the engine’s rev range. And since the only transmission offered is a six-speed manual, in theory you’ll be doing less rowing to keep things exciting. So while the peak numbers aren’t impressive, the new Civic Si should at least be a bit livelier at low and mid-range power levels, which is where drivers spend the vast majority of their motoring time anyway. 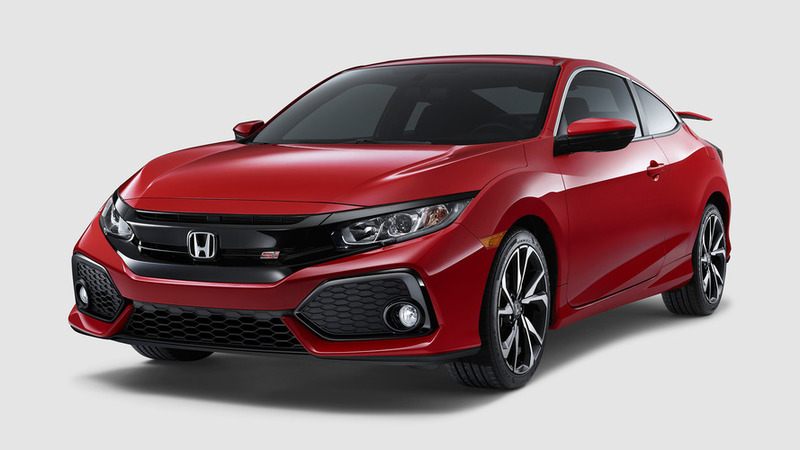 Honda also says the new Civic Si is “significantly lighter than the previous generation,” this despite a more rigid body that uses dual-pinion adaptive electric power steering, sport-tuned suspension, an adaptive damper system, 12.3-inch front brakes, and 235/40 R18 rubber at all four corners with optional performance tires. A helical limited-slip differential helps the front tires cope with power and steering duties. Diving a bit deeper into the Si’s underpinnings, we find stiffer springs with bigger front and rear stabilizer bars versus the outgoing model. Upper control arms are sourced from the Civic Type R; curiously Honda makes no other mention of commonality with the ultimate hot Civic so presumably these are the only shared items. Drivers can choose between Normal and Sport mode to adjust suspension damping, steering input and throttle response. Outside, the Civic Si looks exactly like the prototype we saw a few months ago at the LA Auto Show, and that’s just fine with us. 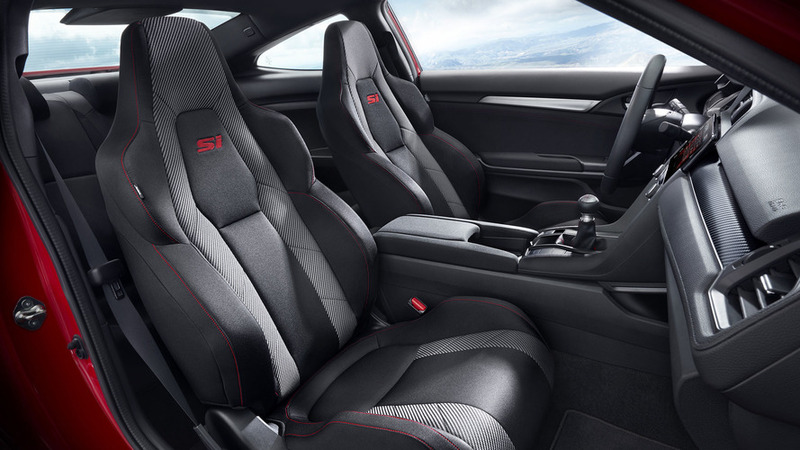 Inside are bolstered seats with the requisite Si red trim. Features like Apple Carplay and Android Auto come standard, accessible along with audio and HVAC functions through a 7-inch touchscreen display. Plenty of features like heated seats, remote start, and rain-sensing wipers are also available. The big question here is whether the arrival of the Civic Type R will take a huge bite out of the Si’s market. Clearly it seems Honda doesn’t want to slot the Si too close to its big brother, but in keeping the power low it could be difficult to justify the minor-league Civic over competition like the Volkswagen Golf GTI, which offers an optional 220 horsepower at the same price point. Then there's the Ford Focus ST with 252 horsepower that also checks in with a sticker price in the Si's neighborhood. Still, while 205 ponies isn’t the chocolate ice cream we were expecting, the new Civic Si might not be entirely vanilla with its lighter weight and stiffer packaging. We’ll have to reserve further judgement until we have a bit of seat time, which should be coming soon. Both the sedan and coupe are set to go on-sale next month with starting prices in the mid-$20,000 range. TORRANCE, Calif., Apr. 6, 2017 – The all-new Honda Civic Si Coupe and Civic Si Sedan debuted today in a global reveal video broadcast on Honda’s YouTube channel at honda.us/2017CivicSiReveal. 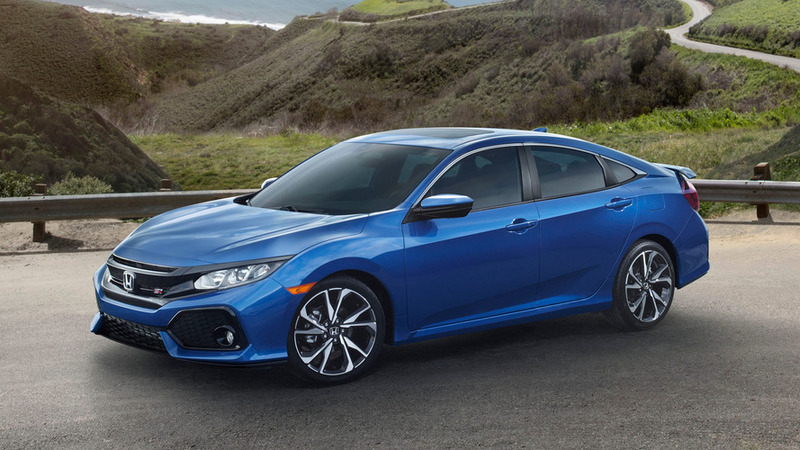 The exciting and dynamic video features the stylish, personal two-door coupe and sleek, accommodating four-door sedan - both sporty Si variants are designed for the everyday enthusiast. 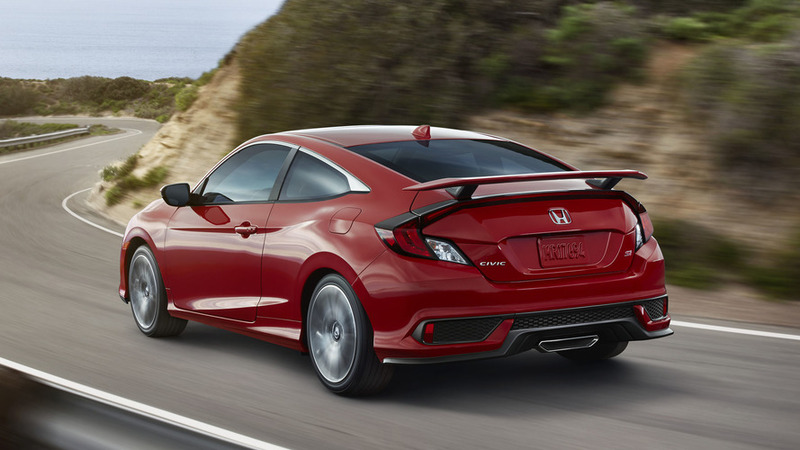 The new Civic Si Sedan and Coupe will go on-sale next month with an MSRP in the mid-$20,000 range. “The 2017 Honda Civic Si is our first turbocharged Si and sets a new sporty compact benchmark in terms of agility and precise handling while building toward the launch of the Type R as the final chapter in our epic 10th-generation Civic story,” said Jeff Conrad, senior vice president automobile division, American Honda. 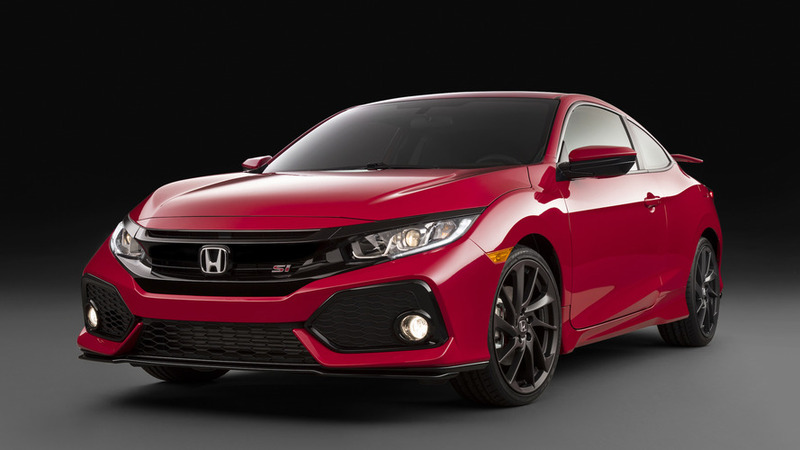 Powering the Civic Si is a high-performance, high-torque 1.5-liter, directed-injected and turbocharged DOHC in-line 4-cylinder engine with dual variable cam timing (dual VTC). Mated to a short-throw, 6-speed manual transmission, the powertrain provides a thrilling new driving experience with more low-end grunt and increased torque output across the engine’s full rev range compared to the previous Si. Peak horsepower of 205 horsepower1 arrives 1300 rpm lower in the rev range, and the increased peak torque of 192 lb-ft2 (+18 lb-ft) is produced 2300 rpm earlier and sustained over 70 percent of the rev range. 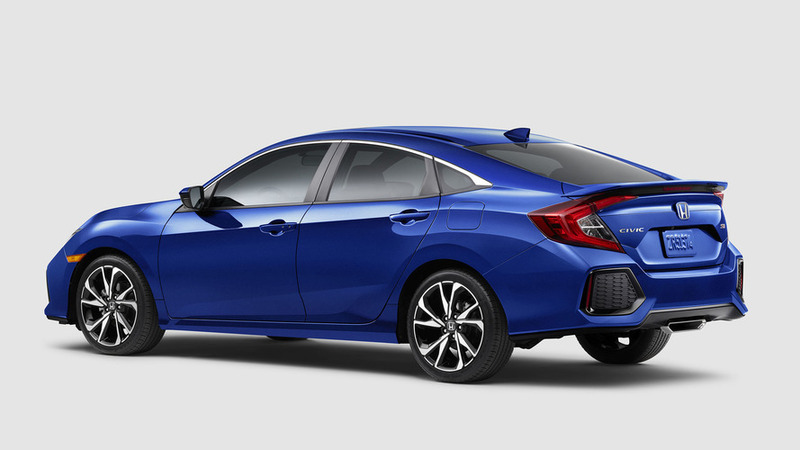 Allowing full utilization of the powertrain, the 2017 Civic Si is significantly lighter than the previous generation model and features a more rigid body including highly upgraded chassis and drive components. These upgrades include a dual-pinion adaptive electric power steering system with variable ratios, sport-tuned suspension, an adaptive damper system, a helical limited-slip differential, larger 12.3-inch front brake rotors and wider 235/40 R18 tires with a performance tire option. In addition to adaptive dampers, suspension upgrades include stiffer spring rates, more rigid stabilizer bars (+30 percent front, +60 percent rear), solid front and rear compliance bushings, and ultra-rigid front upper control arms shared with the Civic Type R.
Accommodating modern connectivity needs, the new Civic Si also includes a 7-inch Display Audio touchscreen that serves as the nerve center for control of audio, HVAC and other functions. The Display Audio is integrated with Apple CarPlay™ and Android Auto™ platforms, providing seamless integration of smartphone features and functions, including app-based navigation, streaming audio, voice-controlled search capabilities, and access to a host of Apple- or Google-approved smartphone apps. All Si models feature a 450-watt, 10-speaker AM/FM/CD sound system with SiriusXM® Radio, HD Radio™ and Pandora® capability. The 2017 Civic Si Coupe and Sedan are designed to provide a high level of collision safety performance in a wide variety of collision scenarios, including offset and oblique-angle frontal collisions as well as side and rear impacts. The Civic's safety performance starts with its class-leading forward visibility and precise, stable and predictable steering, handling and braking performance. Standard four-channel anti-lock brakes (ABS) with Electronic Brake Distribution (EBD), Vehicle Stability Assist (VSA)4 with traction control and Agile Handling Assist further enhance dynamic stability and emergency maneuvering and braking performance. The Civic Si targets the highest NCAP 5-star Overall Vehicle Score. 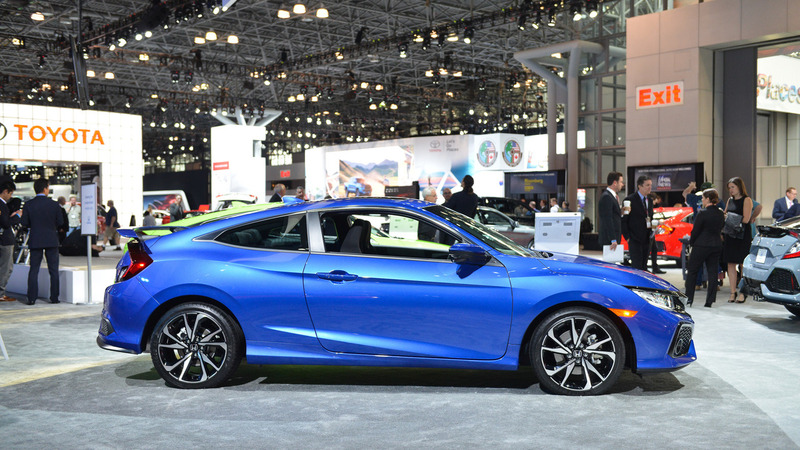 The 2017 Civic Si Coupe and Sedan for the U.S. market will be produced at Honda's plant in Ontario, Canada, using domestic and globally sourced parts. Its engine is produced in Anna, Ohio using domestic and globally sourced parts, at the largest automobile engine plant in Honda's global production network.